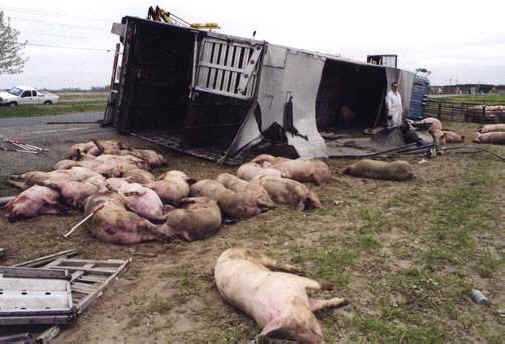 (Pig Exploitation - Transporting - 06) In 2004, a transport truck owned by Smithfield Foods and loaded with 180 pigs flipped over in Virginia. Many pigs were killed in the accident, while others lay along the roadside, injured and dying. PETA officials arrived on the scene and offered to humanely euthanize the injured animals, but Smithfield refused to allow the suffering animals a humane death because the company could not legally sell the flesh of animals who had been euthanized. Similar accidents involving animal transport trucks occur almost every day. After an accident in April 2005, Smithfield spokesperson Jerry Hostetter told one reporter, "I hate to admit it, but it happens all the time."